It’s the spoooookiest episode yet for our sweet baby boys, as this week in Your Parents Basement, the game is Castlevania from 1987! Not surprisingly, it’s very tough, but very fun. You can manually download this week’s podcast here – whip it good – or subscribe to the show via the iTunes store. To manually subscribe, use this link in the device / podcast player of choice. You can also follow us on Twitter, or ‘like’ us on Facebook. 0:00 – Intro, which is The Miinibosses covering the main theme from ‘Vania. Their website is here, and they do a bunch of covers of old vidya game music. 43:15 – Emails. The boys talk about good games for kids, and more inappropriate things. 56:30 – Snifferoo. We are playing the absolute best licensed game of all-time, possibly, next week. 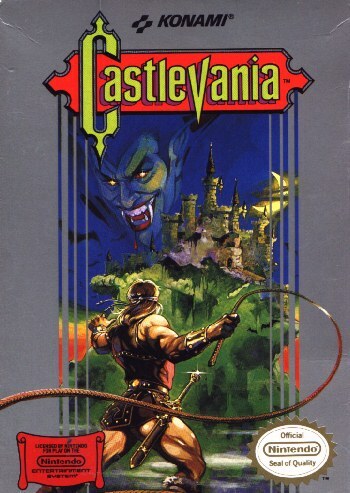 – According to Price Charting, the original Castlevania has held its value very well. The loose cart goes for $21, which is high for a NES game. “Complete” sales (box and manual) average $76, and sealed new boxes range from $250 to $2,000, depending on when they go on sale. It is available on the Wii’s eShop. Symphony of the Night is on Sony’s online store. The other games in the range between $8 and $50 for the cart, up to several hundred for new copies. – Various games of the Castlevania series have been fodder for the Angry Video Game Nerd, most famously, the second game. (Note: Very NSFW language.) He and his buddy Mike also played the Sega Genesis remake of the first game, Bloodlines. Also, past show subject Arino of Game Center CX played Castlevania 3. – There are several Castlevania speedruns, but this one beats it in a little over 11 minutes. – When it comes to the history of development in the Castlevania series, IGN has a good retrospective from February 2014 here. When it comes to the in-game canon history, the Castlevania Wiki is your best bet. Warning: It’s very tangled, as we mention on the show.